Swords & Wizardry Continual Light has sold over 300 PDF copies in 48 hours at OneBookShelf's two storefronts. Wow. Simply wow. Thank you. Proof copies of SWCL should arrive from CreateSpace tomorrow and if all goes well print on demand copies should be available at Amazon by the weekend. The plan is to also have a few dozen signed and numbered print copies of SWCL available for sale at the Frog God booth at GameHole. I can only bring what fits in the carry on, so numbers will be limited. Files for OneBookShelf and Lulu will be worked on this week, so figure a few more weeks before print on demand is available at those sources. More immediately, the monster and magic item releases from September should be laid out and sent to backers by the end of the weekend. Work begins on The Tavern funded adventure this week also. Hope to have that up by GameHole. 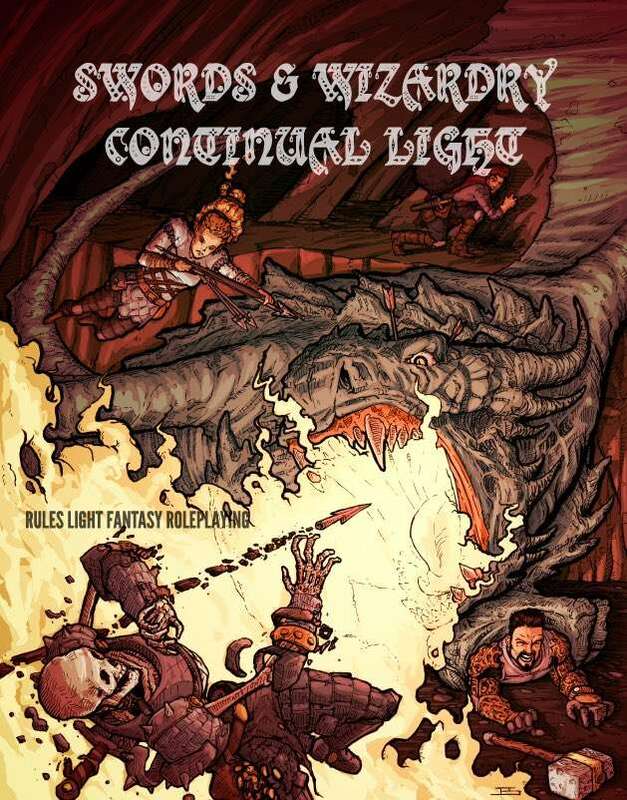 Folks have asked about Torchlight, the Swords & Wizardry Magazine. Now that Swords & Wizardry Continual Light has released everything else should start falling into place. I'm aiming for a January release for the Torchlight PDF, but in any case I expect print copies to be available at GaryCon in March. I am ever grateful for the support I've gotten from the community. Your feedback on the SWCL Beta and SWCL Pre-Release Candidate was invaluable. If you haven't grabbed a copy of SWCL yet, do so. Its PWYW, so there's no reason not to. If you get a chance, please leave a review at RPGNow, even if its critical. Reviews are the bread and butter of success. And spread the word. The more copies in the wild, the more potential third party support for Swords & Wizardry Continual Light. Yes, thats an affiliate link above. When you use The Tavern's affiliate link to make your RPGNow purchases, a small portion is forwarded to The Tavern and supports work like SWCL. So, has anyone done a comparison of Lulu, OBS, and Creatspace POD? Quality and price, etc. I have pretty much just used Lulu and been happy. My one issue was dealt with quickly and properly. I usually save a bunch of books and wait for a good discount code. I believe Douglas Cole / Gaming Ballistic did so. CreateSpace / Amazon claimed it needed embedded fonts, but didn't. Will ship Prime via Amazon. So, if you have Prime, probably cheaper than other options.